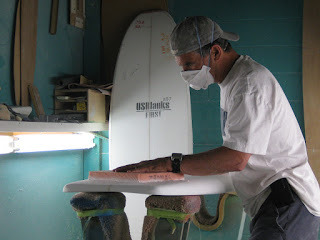 One of the advantages of sharing space in a surfboard factory is that there’s always something surfboard-related that needs to be done. Today I finish-sanded a couple of mini-simmons shapes for my buddy Ray. Last week I finished a 10-6 SUP and another mini-sims for him. Its a cool arrangement; he can keep up with his glassing and ding repair orders, and I get to finish-shape a few boards while waiting for new orders. Plus, I’ll bank some glassing IOUs. The mini-sim in the photo is a 5-11, and after my experience with the 5-6, I think I could actually surf this one. All three mini-sims are for sale, or at least will be once they’ve been glassed and finned. If you’re interested, contact Ray at raylucke@gmail.com for pricing.